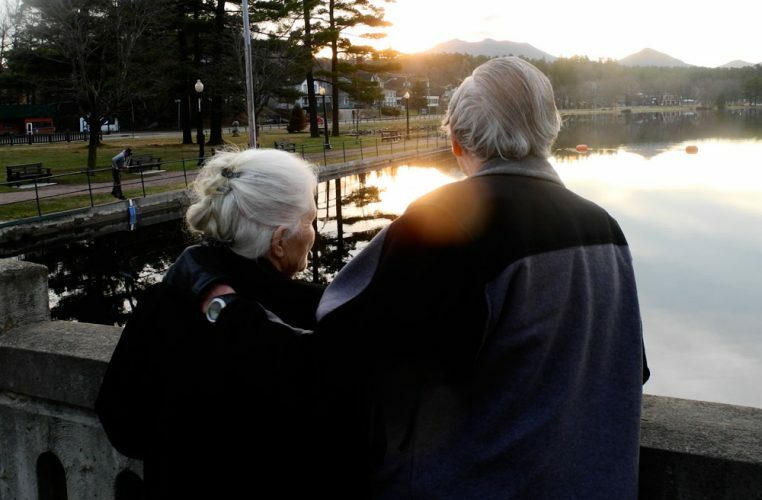 TUPPER LAKE — There’s a saying: “The wheels of government turn slow,” basically meaning that if you want to get anything done through the government, it’s going to take a while. But in Tupper Lake, a group of people has discovered that through persistence, those wheels can be greased. It was a little thing. A 4 foot-by-8 foot patch of decorative concrete next to the sidewalk where snow was to be piled. 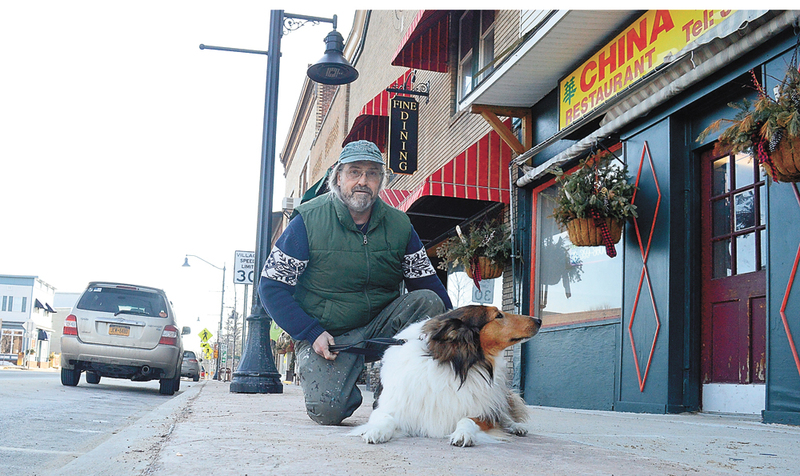 After the $16 million state Department of Transportation project on Tupper Lake’s main street in 2015 and 2016, Park Street looked brand new, with crisp, black pavement, even sidewalks and salmon-colored concrete between the two passageways for snow storage in the winter. 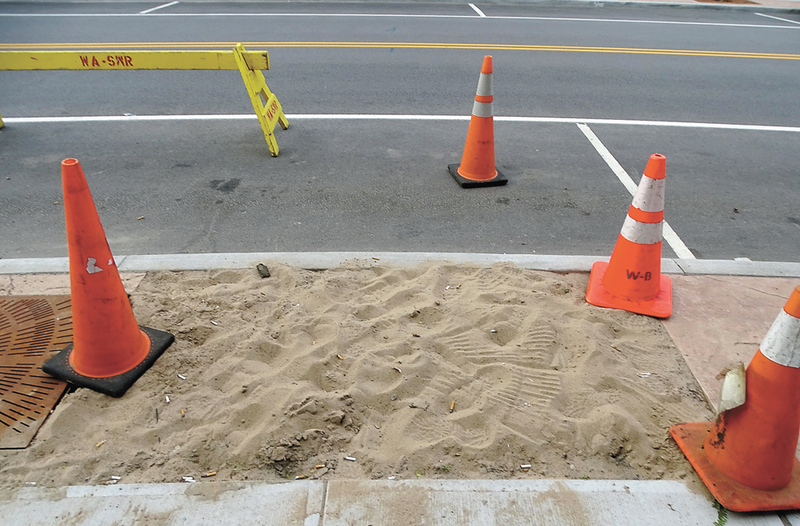 Just half a year after it had been poured, this patch was dug up by the village water department after it was revealed that it had buried a water line shutoff. Village Mayor Paul Maroun said it was determined to not be the village’s fault, and the state DOT agreed to repair the concrete and pay for the construction. The shutoff was also covered by a tree. 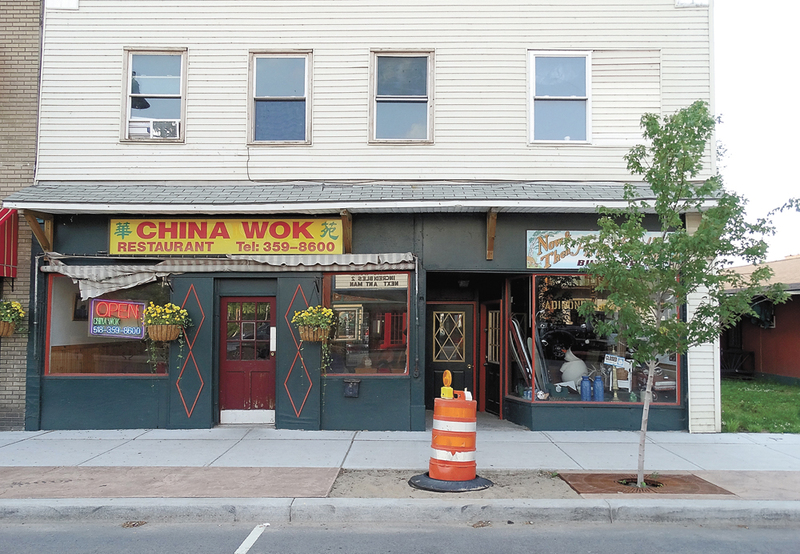 And so, from June 13, 2017 until it was fixed in November 2018, a small portion of the concrete in front of the China Wok restaurant and Now and Then Antiques stood out, a sandy section of an otherwise salmon sidewalk. Lanthier is a familiar face at the village board meetings. He shows up mostly to observe, to bring issues he sees around town to the board’s attention and to weigh in on any public discussion. He is also an avid user of the Freedom of Information Law, which allows citizens to request information from municipalities. On Oct. 10, 2017, he sent his first FOIL request to the village looking for information on the project and why the patch was still there. Over the course of the next few months Lanthier repeatedly brought the issue up at several meetings and sent as many as 10 FOIL requests. At a village board meeting in April 2018, Maroun told Lanthier that it would be finished that summer. However, as the summer went on, the company that had been contracted, Roots Contracting, was not able to make it out. The primary contractor, Kubricky Construction, sub-contracted to Roots Contracting for the job. 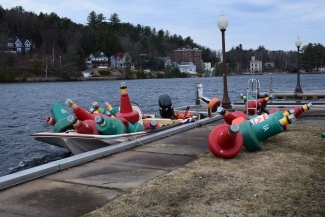 While it would be a quick fix, and would be paid for by the DOT, it was hard to convince the company to drive from Lake Placid to Tupper Lake for a $1,500 project. 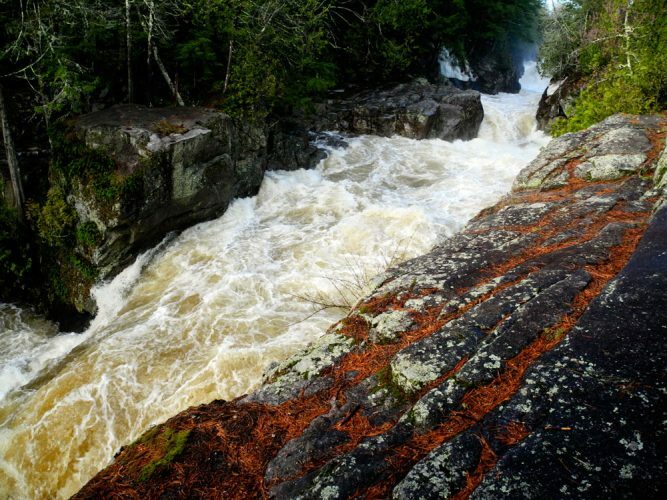 “No company in the middle of summer is going to come back down to do that little patch when they’ve got million-dollar projects in Plattsburgh and Lake Placid,” Maroun said. At an October 2018 meeting Lanthier said got a little offended for Tupper Lake by the hold-up. He said the unfinished project was not good marketing for Tupper Lake. Village Board Trustee Ron LaScala agreed. People joked about doing the job themselves, but that specific shade of salmon concrete mix and the decorative pattern in it were not readily available. The board talked about whether the village Department of Public Works could do the job itself, but determined it did not have the adequate materials or staffing. 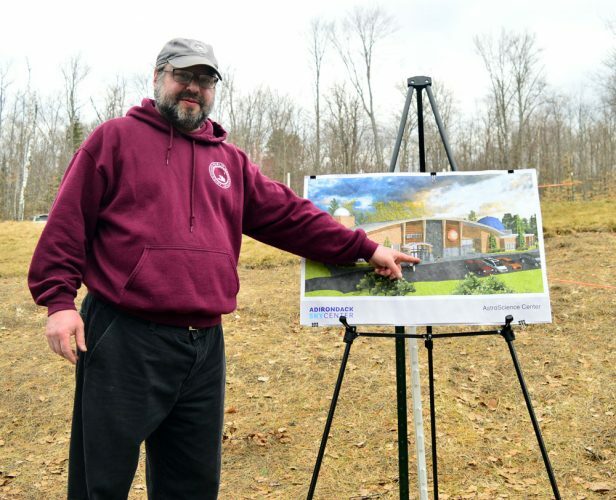 LaScala said the departments were already “stretched thin.” At that meeting, Maroun said the project would probably not happen until the spring of 2019, but that the state DOT had promised to make the village whole. “Things don’t move as fast as people think they should,” Maroun said. Around the same time, Lanthier noticed another problem on state Route 30, a stretch of bumpy, patched road dotted with construction cones and signs on the Moody Flow causeway. The cause of the causeway construction was a major water line break below state Route 30 on March 23, 2017. The next day, a village crew, assisted by Kubricky workers who were still in town, dug up and repaired the waterline to restore service. After the main repair, the road remained uneven, to the point where Lanthier said people would swerve into the opposite lane to avoid it. There were also several construction cones and two signs reading “BUMP” and “PAVEMENT ENDS” that he said turned the scenic entrance to town into a construction zone. Maroun promised the village would expedite the project. LaScala called Franklin County DOT engineer Rob Haynes to get the name of the head contractor at Roots Contracting. It turns out, he and the head contractor, Sam Churco, are related. Churco is LaScala’s cousin, his grandmother’s brother’s son. LaScala explained the need for the patch job over the phone with Churco, sent a text later to make sure the project was still good to go and Churco was out there pouring the concrete within the month. Village Clerk Mary Casagrain said it took around one hour of work. The concrete slab was such a small problem, LaScala said it was easy to overlook, but persistence from Lanthier, from Maroun and from LaScala kept it in sight. It’s easy to go “blight blind,” as LaScala calls it, ignoring infrastructure flaws because you see them every day, but Lanthier’s photographic eye caught it and kept an eye on it. At the November village board meeting the mayor began by addressing the project one last time. “Before we start I want to publicly thank Ron LaScala for getting on the request from Jim Lanthier at the last meeting,” Maroun said. Moving into the public comment section, Lanthier spoke up right away, thanking the board for getting the job done and commenting on how nice it looked. In a letter to the village summarizing the events, Lanthier thanked Casagrain, who is responsible for answering the village’s FOIL requests, and said she did a “fantastic job” answering his questions. Members of the board, though being hounded by Lanthier for answers and fixes to a problem that they did not have much power to solve, did not seem to begrudge him for it. It’s a bit extreme for this situation, as the quote is usually attributed to British Prime Minister Winston Churchill, who is known for his unwavering speeches about perseverance and stiff-upper-lippedness as he led his country to victory in World War II. Still, the quote has validity in the small things in life too, even sidewalks. It basically means, why stop in a bad place? If things are bad, keep moving until they aren’t. “Personally, I find that a lot of time in government when people want to get stuff done, sometimes it takes a long time,” LaScala said. Now, the village has the necessary extra material and experience to work with the stuff and fix any future problems itself. The job is not done yet, though. Lanthier is still talking about the bump and cones by Moody Flow. The area was patched a couple days before it snowed in November, but there are still several cones there and the winter weather has worn the road down again. At the November meeting, Lanthier thanked the board for their work, but didn’t stop there. “Now that that’s taken care of,” Lanthier said, as he moved on to talking to the board about the condition of business signs around town and asking when the code will be updated. Never a dull moment.